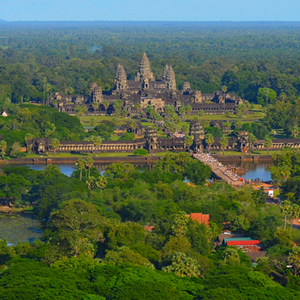 Transitional economies in Southeast, East, and North Asia (SENA), including Mongolia, China, Cambodia, Laos PDR, Myanmar, Vietnam, and the Asian part of Russia (Siberia), have experienced liberalization, macroeconomic stabilization, restructuring and privatization, and legal and institutional reforms over the past three decades, which can in turn affect the environment. Challenges: Urbanization coupled with rapid economic development pressure social, economic, and environmental sustainability. Promising Research: Comprehensive database of LCLUC, socioeconomic, and environmental variables, as well as prediction models, policy implications, and community development. The Mongolian Plateau includes two regions with similar ecological systems but contrasting socioeconomic systems: Mongolia and Inner Mongolia. The Plateau has increasingly received worldwide attention due its rapid biophysical and socioeconomic changes. Building upon intensive previous work in the region, the purpose of this study is to bring together a multidisciplinary research team to examine and model the changes of the natural and human systems on the Plateau as well as the critical feedbacks between them over recent decades. Challenges: Urbanization, environmental sustainability, distinct socioeconomic conditions. Promising Research: Carbon flux, drivers of urbanization, prediction models, human influence on landscape change. 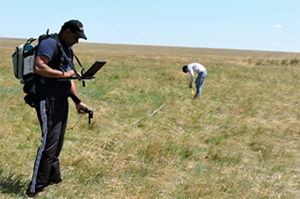 Researchers take measurements in the Mongolian grassland. Photo credit: Dr. Ranjeet John. 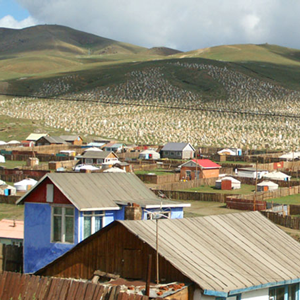 While climate change produced uneven pressures among ecosystems and societies across the Mongolian Plateau over time, the socioeconomic changes and their disparities among administrative units further escalated the complex causal relationships among the elements of the natural system and human system, which affected ecosystem health and society performance. Promising Research: Socioeconomic and environmental conditions database, systems dynamics model involving the differences between Inner Mongolia (China) and Mongolia.